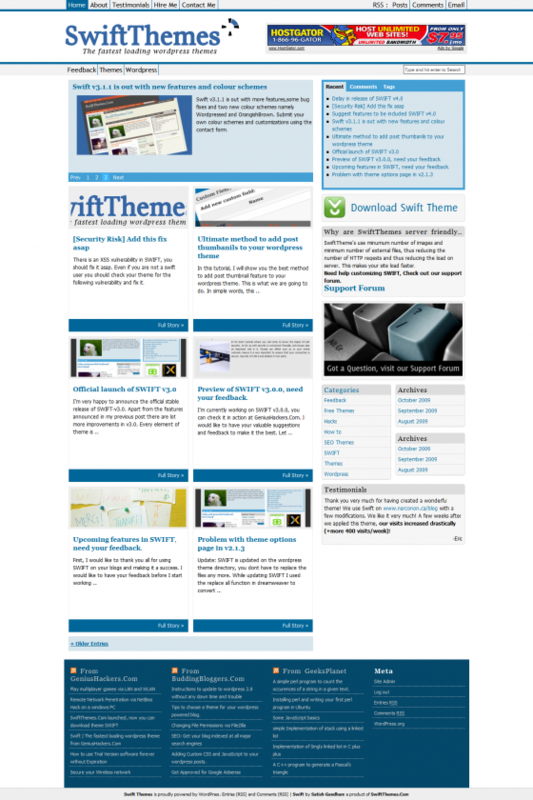 SWIFT, as the name says is the fastest loading, SEO optimized server friendly WordPress theme. 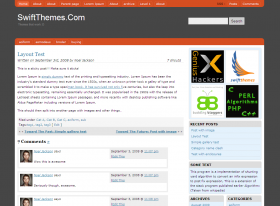 This theme is mainly aimed at blogs running on low server resources and for those who like clean and simple designs. It’s always good have themes like SWIFT at your disposal so that you can easily switch to it if you are expecting a spike in traffic from social media sites. Here are some of the best features of SWIFT which makes it stand out from crowd. SEO friendly, For example,this theme uses h1 tag for post titles, instead of the blog title. Swift is smart enough to pull out the first image from your post and use it as thumbnail on home page (It even pulls out images that are not part of wordpress gallery). Popular posts are highlighted on the home page to give them more exposure, this will turn the first time visitors to your blog into regular readers. Sidebar and footer with four widgetised sections (8 in total) . Adsense integrated into killer locations 🙂 . RSS subscribe box in the best possible position to increase your subscribers. Eight different color schemes to choose from(Will Be added very soon, working on them). Ads integrated into theme options page. I would like to have your valuable suggestions before I release the next version.Please drop in your suggestions here. *Removed the unnecessary brace that crept into style.php in 3.0.5. *Fixed the feed detection bug. *Added option to pick the popular post title and background colour for author comment. *Increased the font size of sidebar title. *Changed content slider sliding style. *Comment luv wasnt detecting the rss feed, fixed this problem. *Removed the padding and margin for smileys. *Added padding to tags widget. *Added featured post slider and tabbed interface. *Option to disable rounded corners in sidebar. *Changed the font style of blog title and post title. *All the paddings and margins are corrected. *Default HTML elements are styled to match the theme. * No serious updates except for few minor changes to meet wordpress theme directory requirements. * Added rounded corner support to safari. * Options page is more user friendly now. * Added gravtar next to post title and gave it a whole new styling. You will love it. * Separate comments and trackback. * Added an option to add Adsense ad under the navigation area. I have been using Adsense for more than three years, trust me when I say that this position has highest CTR and could double your Adsense revenue when used with proper colour combinations. * Fixed the email subscription link. * Fixed some bugs in comments template. * Added the option to disable popular posts on homepage, disabled by default. * If no post is specified for the featured section, most recent post is taken as default. TOTAL_OBJECTS – Congratulations, the total objects on this page (including the HTML) is 9 which most browsers can multithread in a reasonable amount of time. Minimizing HTTP requests is key to minimizing object overhead (see Figure II-3: Relative distribution of latency components showing that object overhead dominates web page latency in Website Optimization Secrets for more details on how object overhead dominates web page latency. TOTAL_IMAGES – Congratulations, the total number of images on this page is 3 . Most browsers can send multiple requests, which can speed display of multiple images. TOTAL_SIZE – Caution. The total size of this page is 112708 bytes, which will load in over 20 seconds on a 56Kbps modem – or 24.26 seconds on a 56Kbps modem. Consider reducing total page size to less than 100K to achieve sub 20 second response times on 56K connections. Be sure to provide feedback for pages over 100K by layering your design to display useful content within the first two seconds. Consider optimizing your site with Website Optimization Secrets, Speed Up Your Site or contacting us about our optimization services. Hello! Thank you so much for this wonderful theme. I am having a problem with the slider. It keeps showing the most recent posts, although I did check the option of selecting a featured category, and selected “Skip posts shown in the slider from WordPress loop”. How is this possible? Thank you for your support and the great job! When can we expect the pull down navigation? I desperately need the ability to create a categories menu with the top level categories in the navigation bar and the related sub categories in drop downs. For whatever reason, I’m not sure, the post images aren’t showing up in the slider, etc. The images that are appearing are the default images. Any ideas? Thank you for the tutorial. There is reference to newspaper layout. I just uploaded the newest version and the three available options are magazine, magazine_full, and blog. In any case, none of these are showing any thumb or slider images still. I’m still searching. But, any further help would be great. did you install auto post thumbnail plugin and generate post thumbnails? New paper layout is the part of premium version. I realy like this theme, loads very fast , great work. Very nice theme..overall its a cool theme..
but i need a simple theme for my blog..
as this is the solution I’m going to use to manage my Media. Firstly let me thank you some million times..I was going crazy trying to find good themes for a makeover of my blog from last 2 years..finally Swift gave me, what I was looking for ! I tried to search the forums, but I couldn’t find a relevant thread…the subscribe.php in version 5.29 is empty…why is it so? ?Sorry , but I am technically challenged, so kinda excuse me for my ignorance. Though I provide the feedburner Id(I mean the ID), the subscribe by email feature is not working..I tried to follow the rules of activation of Subscribe by email feature, but where should I put the code that I get from Feedburner? Second issue I am facing is that the dropdown menu in both navigation bars disappears on hover..I am trying to crack this, but no luck yet.Can you please help me to sort out this…I know you are damn busy , so take your time, but please keep my query in mind. Thanks once again, you have done a fab. job !Kudos ! There is a bug in version 5.29, get the latest version from the downloads page. You don’t have to enter the code, when you enter the feed ID, every thing is generated automatically. What facebook and twitter plugins are you using on this site? Hi, thanks for the best theme i have used. I am facing one problem, in IE6 sidebar is coming after the content of the blog. 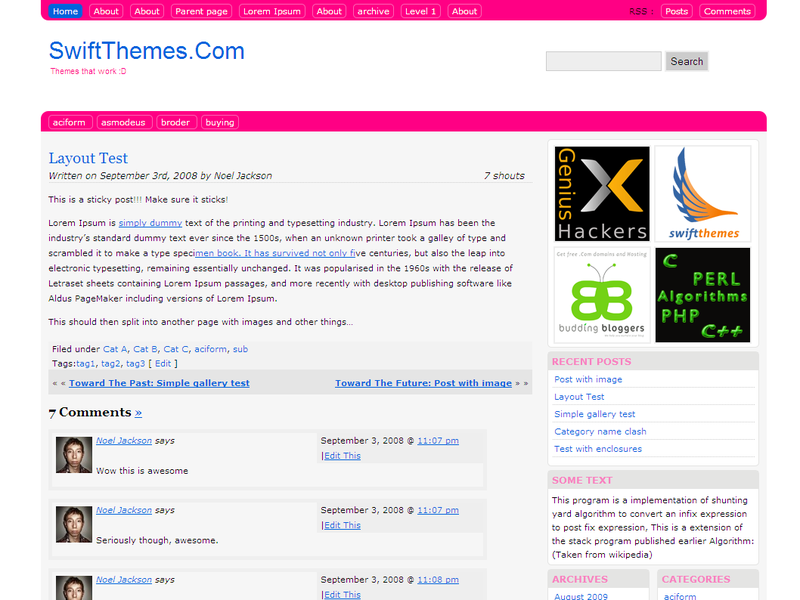 I have tested http://swiftthemes.com/2009/08/wordpress-themes/swift-the-fastest-loading-wordpress-theme/ and the same problem. Hello Satish, I love the theme. I have an issue with the way it looks in IE and the way it looks with firefox. I use the theme in a magazine option. My left and right columns are leveled well in appearance, when viewed in FIREFOX. However, in my internet explorer it is not leveled. In fact, my contents in the left column are all the way at the bottom of the page and the contents in the middle and right columns remain at the same column. I’ll appreciate it if you got back to me, as I would like for it to look the same in internet explorer as it does in firefox. Remove the text widgets which are over flowing? is it compatible with wp 3.0 now ? P.s: when (if) i earn something with donation i will donate to you! Much apprecuated man! Nice theme. Thanks for releasing it free. Estimate number error close : 50 ! The themes looks great and quite impressive.i am downloading it and will post my views in detail once I get a feel of this beautiful theme.Great work! Make a backup of your Atahualpa theme folder and delete it from the themes folder. and upload it via ftp, and activate the theme. 1. i want to make the featured post (sliding post) with my recent post. how to make it? 2. i want to make the comment form like this, (with editor). how to make it? 1. If you dont select any category, it will show the recent posts. Very nice and clean theme! I like the fact you’re optimizing for speed and SEO. Unfortunately nested pages and categories break the theme. Have a look at the preview here http://wordpress.org/extend/themes/swift to see how the sub pages break the navigation, at least on Firefox 3.5. Will this be fixed soon? I’d be more than happy to use the theme! Thats already taken care in versions greater than 2.0.7, I uploaded the latest version to wordpress theme directory and waiting for them to update it. You can get the latest version on this page, its updated when ver there is a update. 1. The link highlighting (a:hover) in the sidebar doesn’t fill the whole row, there’s a gap on the left side. Great theme to jump start my long-dead blog back to life. Thanks! nice theme! save loading time! Very nice theme, i like it. Thx! this is one of the simplest themes i’ve ever seen. and fast loading just to add to the coolness. BTW, when I click on the “about” link of the pages widget on the sidebar, the background color is too dark. Thanks dude, I will take care of it in the next release.